The Purbalingga District's DPRD members, conducted a work visit (Kunker) to City DPRD, Monday (3/19).
" We have never been to foreign countries since it is difficult. 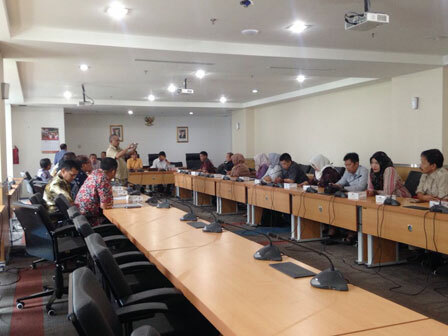 Therefore, we want to imitate Sister City in Jakarta"
Purbalingga District DPRD Chairman, Tongat disclosed that the purpose of his arrival was to study the mechanisms of cooperating with overseas or Sister City that has been applied in Jakarta. Considering, his region has one of the production centers of wigs that are exported to South Korea. "We have never been to foreign countries since it is difficult. Therefore, we want to imitate Sister City in Jakarta," he expressed, at City Council building, Monday (3/19). Responding on this matter, City DPRD Honorary Board Vice Chairman, Syarifuddin acknowledged that he deeply regrets the council members of Purbalingga cannot take kunker to foreign countries. Hence, there would be cooperation that benefits both sides through Sister City. "If you want to do kunker to foreign countries, just make a report to Home Ministry (Kemendagri). And then send a letter if you want to make cooperation with Seoul DPRD for instance," he said.